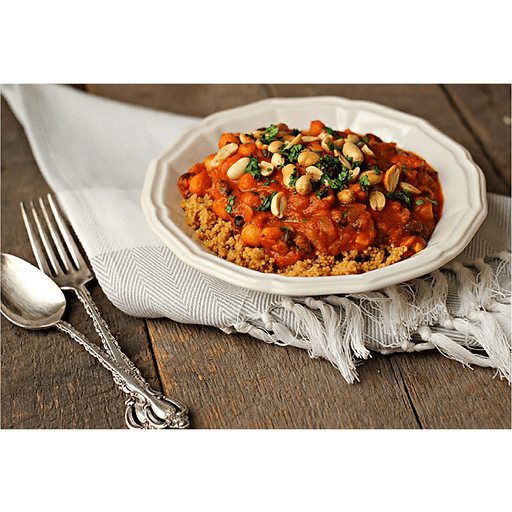 Packed with fiber and flavor, this Pumpkin & Bean Curry will be a new cool-weather favorite! 1. Bring water to a boil in a small saucepan. Stir in whole wheat couscous, cover and remove from heat. Set timer for 5 minutes. Remove lid and fluff with a fork. Set aside. 1. In a large pot or skillet, heat olive oil and add onion, cooking for 3-4 minutes. Add garlic and cook for another 30-60 seconds. 1. Add pumpkin, canned tomatoes, vegetable broth, coconut milk, black beans and garbanzo beans. Stir in 2 Tbsp. red curry paste, salt and pepper. Allow to simmer for 15 minutes. 1. Add honey and stir to combine. Add additional 1-2 Tbsp. curry paste if you want a more intense flavor and spiciness. Adjust seasonings, if necessary. 1. Serve on a bed of couscous and top with toasted peanuts and chopped cilantro (optional). Calories 320, Total Fat 5g (Saturated 1.5g, Trans 0g), Cholesterol 0mg, Sodium 260mg, Total Carbohydrate 57g (Dietary Fiber 12g, Sugars 12g), Protein 12g, Vitamin A 80%, Vitamin C 20%, Calcium 6%, Iron 15% *Nutritional values are an approximation. Actual nutritional values may vary due to preparation techniques, variations related to suppliers, regional and seasonal differences, or rounding.